On a spring morning, Sara O’Hora and I had the great privilege of doing an interview with Peggy Stewart for The Quilter. “Fancy being invited to a Garden Party just for making quilts” said Peggy. Now you and I know that Peggy doesn’t `just make quilts’. South West Quilters doesn’t give Honorary Life Membership to just anyone with a room full of fat quarters’. If they did we’d all have free membership wouldn’t we? 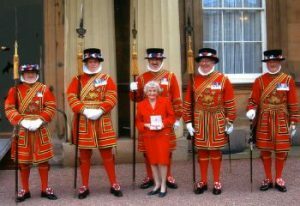 No, Peggy had been invited to take tea with Her Majesty in recognition of the quilts she has given to almost every Hospice, Nursing Home and Hospital in the South West. Somewhere around 800 quilts to date. When the Stewart family moved back to England they lived in Looe and after seeing an advert in the paper for interested parties to attend a meeting in Launceston, Peggy went along. That was the first meeting, in Daphne Turner’s garden, of FLOWERPATCH QUILTERS. She learned that day of the QUILTERS GUILD so she joined that too and so began her travels around the country learning new methods and techniques, which she then adapted to her own style. She is also a founder member of CARADON QUILTERS. Talking of fabric, you can just about see Peggy, at her sewing machine in her workroom from behind the piles of material she collects from all over the world. Her recycling of sheets and duvet covers into her easy care machine stitched charity quilts is in itself worthy of a medal. Hand quilted, prize-­winning works of art surround these quick quilts, and the awards from numerous shows line her walls and stairs. In pride of place is her certificate of Honorary Membership from SWQ. We offer Peggy our most sincere congratulations and thanks, for not `just making quilts’, but for everything she has given us.